Our guardian angels are with us all the time. 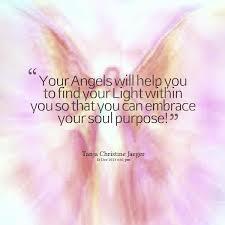 These angels are pure beings of Divine light, and we can trust them to help us with our life. Angels are heavenly messengers, they carry information to us from our Soul. Our Angels love us unconditionally, they look past the surface of who we are and see the goodness within. Our Angels do not judge us, they only bring love and hold faith for our lives. It doesn’t matter if you aren’t a believer, our Angels believe in us. They see our inner light, and how bright it shines. They know everything about us. They understand that we have an important mission in this life, and they know our true talents. They want to help us with everything. Our Angels are the ones that send us whispers to help guide us on our path. Quietly murmuring in our ear when they need to get our attention. They are the light behind our eyes. Angels believe in us, even when we don’t believe in ourselves. They don’t judge us, they only bring love into our life. There are many Archangels to whom we may ask for guidance and assistance. Archangel Raziel presides over the action of turning knowledge into practical wisdom. Raziel is like a wise old wizard. He helps us to recall all the lessons that our soul has accumulated over time, so that we may condense these into usable energy for our present life’s mission. Raziel assists in the healing of painful memories and past traumas. Raziel helps us to take back our Personal Power in this life experience. When calling upon Raziel hold a piece of clear Quartz to help you connect with his energy. Archangel Chamuel’s mission is to manifest universal peace. Through helping each one of us attain inner peace, even during turbulent times. Chamuel can see a solution to every problem, and he helps us to reunite with our life’s purpose, and the betterment of our life, as long as it is in alignment with our higher self’s path. Pale green is the colour that represents the energy of Chamuel. A piece of Fluorite gemstone can be useful in connecting with Chamuel’s divine energy. Angels believe in us, our work is to believe in ourselves. Our Angels help us to achieve this, if you are open to the concept. Something for you to think about today!